Alan Shore for the defense, your Honour. "Well, obviously, Lionel Tribbey is a brilliant lawyer whom we cannot live without, or there would be very little reason not to put him in prison." How is this guy trusted with anything? Some characters have pervasive or extremely noticeable personality quirks, but somehow remain faithfully employed because they are just that good at what they do. 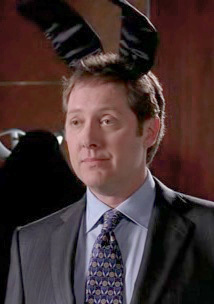 Coworkers, superiors, and friends are willing to overlook certain informalities because of this (e.g., a hypothetical highly successful lawyer who happens to wear fuzzy pink bunny ears during all his cases) so long as they get the job done and cause a minimal amount of intentional problems. This is a cost/benefit ordeal: if they weren't so good at their job or their quirks were too obstructive an employer would consider them a necessary sacrifice for sanity. Much like the Genius Ditz it is a strange mixture of brilliant and bizarre, the unexpected quirks only tend to bother new characters who don't know them well. Their quirks don't seem to be intrinsic to his success, a la Crazy Awesome. Compare the Insufferable Genius, whose quirk is more often just being a Jerkass. The Insufferable Genius might insist everyone address him as "sir" or "Dr. Smith". The Bunny Ears Lawyer might not answer unless addressed as "Grand Duchess Abigail Chester Wilson Snapdragon Lemmywinks Brian Brain McFisticuffs the Negative 10th." There are lots of Bunny-Ears Lawyers out there, as the length of this page can attest, mainly because having the character be an expert allows the writers to plausibly put them in any situation they want while the quirks are to make the characters interesting and unique, and there is some Truth in Television to this trope--just check out the Real Life section. Authorities in educational or professional environments will sometimes ignore quirks, especially if they don't have any relevance to the degree or job at hand. While you're unlikely to see something as extreme as a bunny ears-wearing lawyer, you will find plenty of examples of people who remain employed despite their quirks. A form of Ultimate Job Security. For situations where the strange guy is the one in charge (and uses their strange behavior to run their business) see The Wonka. Uniformed examples may overlap with the Military Maverick. Luckily, they're never Ax Crazy. Usually. For an ultra manly-man who pulls off some girly hobby and nobody minds, take a refresher in the fact that Real Men Wear Pink. Remember: In order for a character to qualify he must keep his job through sheer unquestionable competence. Some examples are of incompetent characters that happen to be quirky and keep their jobs through means that have nothing to do with their competence. This page was last edited on 31 July 2017, at 02:42.